Der Autotransporter MODERN EXPRESS geriet auf Grund von Ladungsverschiebung mit einer Schlagseite von mehr als 40° Steuerbord im Golf von Biskaya in Seenot. Am 26. Januar 17.00 UTC wurde dass Seenotsignal gesendet. Spanische Rettungshubschrauber evakuierten alle 22 Mann Besatzung. Das Schiff war unterwegs von Owendo (Gabun) nach Le Havre (Frankreich) mit einer Ladung von Holz und Fahrzeugen. 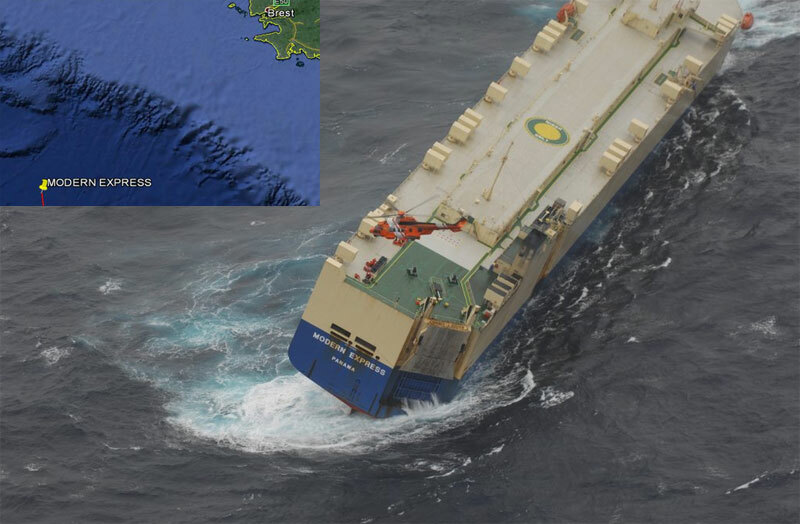 Car carrier MODERN EXPRESS developed heavy list of some 40 degrees starboard in Bay of Biscay, and issued distress signal, as of 1700 UTC Jan 26 disabled vessel was adrift in vicinity 46 11N 008 02W, some 200 nm south-south-west of Brest, France. Vessel is in UK MRCC zone, rescue was a joint operation coordinated by MRCC UK, France and Spain. Spanish rescue helicopters airlifted to safety all 22 crew, no injures reported. Vessel was en route from Owendo Gabon to Le Havre France, with cargo of wood and vehicles, apparently shift of cargo caused heavy list. Vessel is to be removed from area where she’s dangerous for shipping, before morning Jan 28. Photos from Salvamento Maritimo Spain. Car carrier MODERN EXPRESS, IMO 9231688, GT 33831, built 2001, flag Panama, manager CIDO SHIPPING HK CO LTD.